At a time when action RPGs were truly beginning to catch on with gamers, Soul Blazer came along and offered up an adventure that was as charming and engaging as any role-playing game fans had experienced. 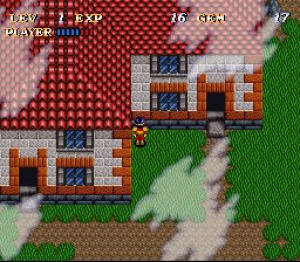 Taking many of the unique gameplay elements found in the Actraiser title that came before it, Soul Blazer carefully crafted the gameplay mechanics with a more traditional RPG presentation; resulting in a game that not only featured plenty of sword-swinging action, but was also packed with plenty of the strategy and exploration elements expected from the genre. And while the game certainly didn't light up the sales charts, it's gone on to become a beloved action RPG package that still commands a lot of attention among retro gamers, even all these years later. 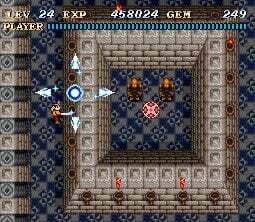 Soul Blazer takes the enemy lair gameplay of Actraiser and uses it to control the flow of the storyline taking place throughout the game. As you defeat all of the enemies in a particular lair, you'll be able to release a living being – be it a plant, animal, or even a human being. From these released beings you'll be given information that will guide you on your quest and help you locate items needed in order to progress through the game's many areas. And while you'll accomplish most tasks with your sword, the game will toss you other useful items to help you out along the way. The game is broken down into several different areas, and in each area, you'll find plenty of enemy lairs to be destroyed. Through doing this, you'll begin piecing the many parts of the area back together, one living thing at a time. Once you've taken out the lairs, you can venture back to the area and begin speaking to the various beings you've released in order to solve the quest presented to you. The work isn’t quite over, though: it's at this point that you'll have to square off with the boss of the area, and, if successful, you progress on to the next area. Much like a traditional RPG, your character will begin levelling up as you take down the many hostile inhabitants of the lairs. You'll also start discovering better weapons, armour and magic from the released beings as the story progresses further. This is what makes it so important to take out all of the enemy lairs – to make sure that you don't inadvertently miss special items that you'll need along the way. 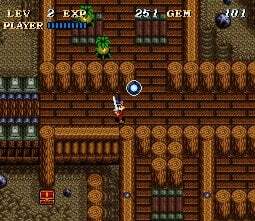 Through encouraging players to defeat all enemies, the game generates a balance between the character’s strength and that of their enemies, thus providing a perfectly smooth difficulty curve. Of course you'll still have to figure out the patterns of the many enemies and bosses if you're to have any hope of beating them (which is sometimes easier said than done), so it’s not always smooth. The Quintet-developed titles have always had a very distinctive look to them and Soul Blazer is no exception. While the visuals aren't quite on par with some of the best the SNES has to offer, they're still brilliantly constructed and extremely varied from area to area. Even the characters themselves show a nice level of detail; as do the enemies from the various lairs, despite their small stature. But if you want to see the game at its most radiant glory, you'll want to be sure you pay attention to the area bosses. They might not be as enormous as many you'll find in some other 16-bit RPG releases (except for maybe Deathtoll himself), but what they lack in size they more than make up for in detail and originality. You have to give credit to Quintet for sticking with a specific visual style and once again making the most out of it. It would be nearly impossible to accurately describe the musical score found in Soul Blazer. While not the fully orchestrated experience found in many other RPGs of the era, it's quirky style and charming catchiness still perfectly carries the unique mood of every location. There's honestly not a bad musical track in the entire game; how the composers were able to so accurately capture the mood of each situation is truly astounding. You'll definitely be hearing these tunes in your head long after you've put down the controller – testament to how catchy they really are. It's clear from the beginning that much attention to detail was paid the game's soundtrack and the end results are quite impressive. But if there's one area of the game that truly shines brightest, it's the fantastic control system. Everything from swinging your sword to making use of the many speciality items is intuitive and extremely easy to do, even in a pinch. You'll also find it quite rewarding in the way you essentially control the rebuilding of each area piece-by-piece. It presents a nice diversion from the standard hack 'n’ slash action that's so prevalent throughout this title. Couple all of these amazing gameplay features together with the unique and engaging storyline and you have one of the most charming and enjoyable RPG experiences available on the Super Nintendo console – a true high point for the action RPG genre. There's certainly no denying the quirky charm Soul Blazer emanates as you take part in the quest, but what makes this game such a joy to play is the incredible play control system and unique gameplay elements inherent throughout. Who would have ever thought that some of the better ideas from Actraiser could ever make for such an engrossing RPG experience when placed in the right developer's hands? Sure the game is sometimes criticized for being a bit too easy, but that's only if you take the time to meticulously perform all of the tasks given to you in each area. If you want to see what the action RPG genre is really all about, look no further than this amazing 16-bit classic; it's still one of the greatest ever created – yet another top-tier RPG title for the Super Nintendo console. First Ive heard of this game. Hopefully one day it will come to the VC. I want it to come to VC now. "Still one of the greatest RPGs ever created." That said it all. You could have skipped the review. Fantastic review, Corbie. A 9 well deserved. I wonder if this great classic will ever hit the VC? Thank you for that awesome review Corbie! This game remains one of my all-time favorites and I really hope that it will come to the Virtual Console some day! It really is an underappreciated gem of a game and a shining example of how great retro gaming can be! Published by Enix. Will Square Enix release some of ENIX's greatest hits. I hope so. I almost forgot about this game. Good review. I ran through the game again these past few days and it was as great as ever. Still one of my favorites. Now to get started on the next SNES review. I recently finished it for the first time on my SNES. It's a good game but its overshadowed by its two sequels, Illusion of Gaia and Terranigma. I'd have given it 8/10 as the dungeons can get repetative. I wouldn't worry about it coming to the VC, I expect the whole trilogy to come eventually but in the meantime everyone who wants it should make sure to download other Quintet releases such as Actraiser to boost its chances. All the Quintet games are notable for their interesting religious themes which survived NOA's strict "don't mention God" 90's policies more or less intact. God just became "the master". I consider Illusion of Gaia to be the black sheep of the series. I don't think it's nearly as good as Soul Blazer or Terranigma. The difficulty curve was all over the place and the story was a bit sluggish. Never got to play this one. Sounds like i missed out on a great title. I can already tell this'll be an excellent way to send off the week and head into the weekend. I love the SNES so much. Anyways, thanks Corbie for the excellent review of a SNES RPG which I have yet to play, sadly. I'm going to start praying for a VC release of this game, as it looks right up my alley. I never got the chance to play Illusion of Gaia or Terranigma but I would love to try them out some day! Hey Corbie, is your next retro review going to be about Arcana? Those latest screenshots on the main page lead me to believe that it is. They're just to throw you off. I can promise you, Arcana isn't coming any time soon, maybe not even in this 15 reviews special. I won't be putting the shots, artwork, and banners until the Friday the review is coming out on. And if you haven't played Terranigma, you are missing out. My second favorite RPG of all-time behind Chrono Trigger. It's unbelievable! Do we have a skies of arcadia review? And when are we gonna get gamecube review sunday? I'd love to import Terranigma someday, but I know nothing about importing SFC/SNES games without the aid of a regional adapter. Well Terranigma is a PAL release, at least the one in English, so you'll have to install a PAL switch in your SNES and that requires a bit of soldering wires and a switch. @Corbie: I KNOW I'm missing out not having played Terranigma. But unlike you, I don't have some awesome friend making custom carts for games not released in America. EDIT: And I'm not modding my system, either. Period. My brother got a ROM on his laptop, but he won't let me borrow it. I'd really rather have it on VC, of course. The Squenix habit of releasing VC games that were never in English at all of late is getting REALLY old. 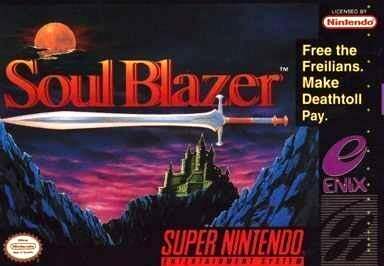 Personally, I'd give Soul Blazer a 10. I really can't think of a single negative thing to say about it (I didn't see any in the review either, so I'm not sure why it only got a 9, but whatever...even that score is awesome). As a testament to the game's awesomeness, I went upstairs a little while ago to see my mom just having finished off Deathtoll, watching the end scenes. It's the only non-puzzle game she likes outside of The Legend of Zelda, so you know it MUST be awesome! Hmmm...what does a PAL switch look like? 'cause I tried looking it up on Google, but Google didn't help much. You have to remove 2 pins on the SNES PPU1 and PPU2 chips. You then solder the wires to a switch and use a resistor on the power control of the system to fool the system into thinking it's powering up on a European electrical current. That way the Terranigma cart will pass the boot check and then you can switch back to NTSC. That's why you must use a "break before make" switch. And don't slip up, you remove the wrong pin on the chip and you can take your SNES to the garbage can and toss it, it's ruined. All the talk of Enix got me thinking about their SNES title Robo Trek. Can we be expecting a review of this sometime in the future? Brilliant game - totally agree with the score. This makes me want to play it all over again! The look reminds me of Actraiser and Secret of Mana. Will definitely buy this one! 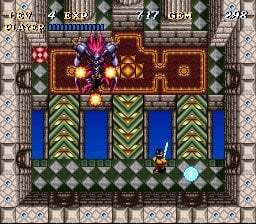 Soul Blazer is a great game but I find the spiritual successors, Illusion of Gaia and Terranigma, to both be superior. The series just kept getting better as it went and it's a real shame that the latter has still not seen any form of release (outside of emulation) in the United States. How I'd love to see all three of these games pop up on the VC eventually. They're all must-plays. Most people who criticise Illusion of Gaia do so for its linear nature but I'm rather surprised that Corbie finds the story to be its fault. In my view the story in IOG is the most well presented of the Soul Blazer trilogy, a deep, very philosophical and at times darkly tragic tale that advances some of the introspection found in Soul Blazer. The characters, especially the main group of friends are far better developed than in Soul Blazer where the story is rather undernourished at times. As for the difficulty curve, if anything I've seen criticism of the game that its too easy. I can't recall anything particularly difficult about it especially in comparison to Terranigma which was the first of the 3 to require grinding and had a maddendingly hard final boss. @StarBoy91 @Stuffgamer1 and @Corbie Regarding the Terranigma issue, any Nintendo Life gamer not confident enough to mod a pal switch on a US SNES (I know that I would not have a clue how to do it), I could offer another option. I would not mind picking up a UK pal SNES (from ebay about £10 to £30 depends on what games comes with and condition) and sent it over to the States for you. I would not be doing it to make money, it would just be to help out a fellow gamer. Sadly it would not be a cheap option (pal Terranigma between £50 and £80) and then there is shipping. I realise as I type this it sounds like an expensive option and there are further complications. When I import US consoles I have to buy a step down converter so my plug/power supply does not blow the console. I would guess that a US gamer would have to buy a step up converter, if one exists. Obviously this solution is increasingly unattractive! Anyway the offer is there, I am not a rip off merchant, although I realise that anyone on the internet could say that. Great review by the way @Corbie, I love Super Nintendo Fridays. For faults, the only thing that comes to mind is that it can get a bit tiresome at times when the game keeps sending wave after wave after wave of enemies at you, none of which are particularly hard to kill. The two sequels toned down the fighting a bit. But yeah, absolutely brilliant game, very well-deserving of a VC release. @JamieO: Thanks for the offer, but I think if I was THAT desparate to play the game, I'd just emulate anyway. Which, as I said before, is what I WANT to do (as long as VC isn't an option, of course). I just have to finally manage to get my brother to set up his laptop so I CAN! No worries about us thinking you were trying to rip us off, either. I've seen people doing that kind of stuff online before. There's this one guy who's the go-to guy for Japan-only imports on Earthbound-related stuff over at Earthbound Central and Starmen.net. Willing, helpful guys like you are the best. @Adamant: I don't see any problem with the balance of it, personally. I can see where some would though, I guess. @Stuffgamer1 Ha, ha, the idea popped into my head as a nifty way of reducing extra importer's costs (i.e. by having a buddy in the other territory, whenever there was a desirable rare game). However, as I was typing my comment I realised it sounded more and more ridiculous. @StarBoy91 @Stuffgamer1 and @Corbie I really wasn't thinking, I have just realised that any UK eBay seller would send you the console/game direct to the US from their sale! A US gamer would not even need me as a middle man. Doh! (I have slightly red, embarrassed face right now). D: Spoiler! You shouldn't show the final boss right in the banner and preview picture. But seriously, I wish the whole TerraEarth trilogy would come to Virtual Console. I'm sure the licensing would be a pain to work out, though, since Nintendo published Illusion of Gaia and Terranigma while Enix published this one. @JamieO: Yeah...I guess hangover posting WOULD be a bad idea. Me, I haven't been to bed yet. It's almost 6am local time. @Sabrewing: Isn't there usually a statute of limitations on spoilers? This game is so old I don't remember not having it, for crying out loud! I mean, I guess you have a point, in a way, but it's not really such a big deal, is it? It doesn't even technically spoil the story at all...you know from the start that Deathtoll is the final boss! Does it really matter if you know what he looks like in advance? I don't think the licencing would be TOO hard to work out. They got Super Mario RPG on VC, right? This SHOULD be easier than that, I would think. ... I guess my "But seriously" didn't mean much. I love Terranigma, it's my very favorite Action RPG out there. However, I was skeptical about Soul Blazer, but after this review I'm going to check it out. I didn't like Illusion of Gaia too much, which is why I lost interest in going back even further. It kinda bugs me how sometimes you see sprites and it looks like the developer only made the left half (or right half) of it, copied it and flipped it over for the opposite side. Seems lazy. Great review, I might buy this game. @ Betagam7 - The Gaia boss at the end of Terranigma wasn't really that difficult. Not nearly as frustrating as a few in Illusion of Gaia. And the story in Terranigma is easily leaps ahead of the two other games in terms of variety and flow, IMO. @Sabrewing: Oh yeah...sorry about that. Didn't make the connection last night. @Mario maniac: Most games of the time did that, though...commonly known as "sprite mirroring." Even Link to the Past did that, with the instruction booklet spouting some crap about holding the shield toward Death Mountain to repel evil to explain it away! No way. "Sprite mirroring" bothers me too, sometimes. For example: SF2's Sagat's eyepatch magically appears on his other eye when he turns around. That I mind. I don't mind if the sprite was flipped making the character look ambidextrous (Simon of Castlevania comes to mind). Regarding Super Metroid and SoulBlazer's main characters, no sprite flipping was involved. Thank goodness. Great review, Corbie. And you know I don't throw that around loosely! This game was and IS so good, a breath of fresh air in the same way Beyond Oasis was. And you're right, half the fun is to try to uncover all the secrets. I'm a big fan of Illusion of Gaia, tough to say which better. Apples and oranges, both are super games. I remember playing this shortly after finishing Zelda 3. It's one of those games that makes me wish I had more spare time - I'd love to complete this all over again but there aren't enough hours in the day. Awesome review as always Corbie! Honestly, it's a damn shame this isn't on VC yet, I'd love to play this one again soon. But I'd like a review for "Illusion of Gaia" as well. And I agree, the story in Terranigma was pretty good, probably my favorite aspects of it. You don't see stories that good in action-RPG, not even to this day. Granted, most action-RPGs have terrible stories, IMO. I looked up that the first boss, Solid Arm, appears as a secret boss in Illusion of Gaia, the follow up to this wonderful game. I find no faults with SoulBlazer at all. This game ranks in my top 20 SNES games of all time. It's so good and Quintet used some this game's sprites for the pseudo sequels Illusion of Gaia and Terranigma. It is one of the greatest Action RPGs ever released.